Strathmore is a gorgeous new addition to our stunning portfolio and ticks almost every box in the border town of Wooler. 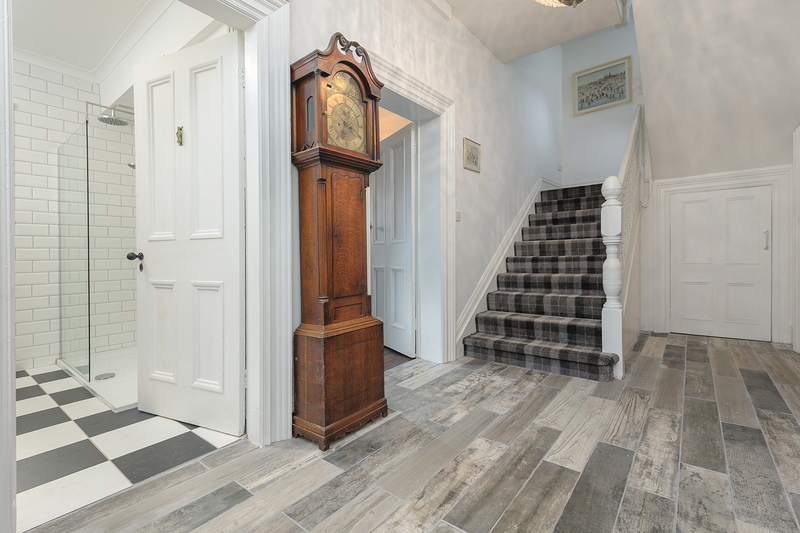 This beautifully-refurbished Victorian semi-detached home built in 1890 was the original residence of the first village vet and had been for 3 generations. Now completely refurbished, Strathmore oozes luxury and is perfectly equipped for the modern family seeking a country escape in this large luxury house with a hot tub. Situated in the friendly and vibrant country town of Wooler, Stathmore is within a short walking distance of the pretty high street, with a small but plentiful selection of local shops, pubs, restaurants and cafes. Wooler is often referred to as a perfect base for walking as it sits on the edge of the Cheviot Hills. Strathmore has an open fire and a wood burning stove for cosy nights in, as well as a hot tub outside, privately situated in the pretty garden. 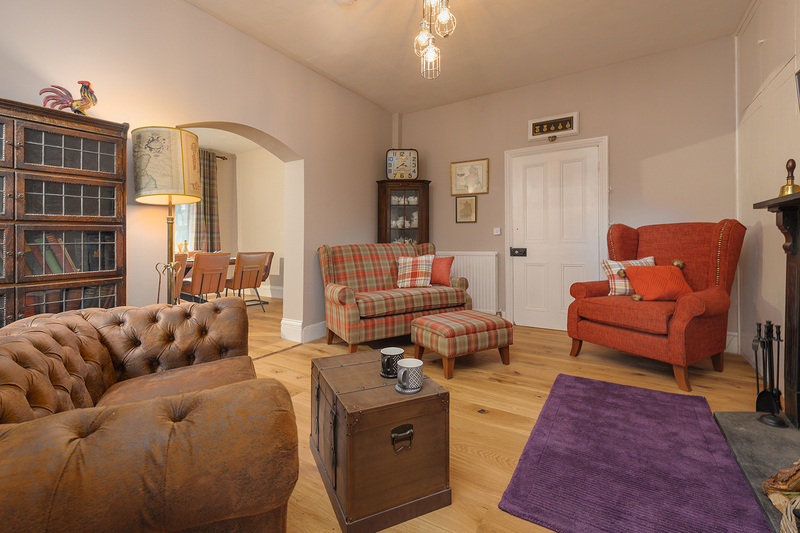 The house comfortably sleeps 10 guests in 5 bedrooms with 2 family bathrooms and 2 en suites. 2 dogs are very welcome and there’s free Wi-Fi as standard. Strathmore sleeps a total of 10 guests in 5 bedrooms across 3 floors – 1 super king; 2 king size; 1 twins or super king; and 1 fixed twin single room. There is 2 family bathrooms and 2 of of the bedrooms have en suites (one of which has a roll-top bath in the bedroom!). Downstairs you have a fabulously spacious galley kitchen with large windows overlooking the south-west facing furnished patio. The dining area has an almost floor-to-ceiling window overlooking the garden which then leads into the snug with the wood burning stove. The lounge is a grand room focusing around the original open fire, with comfortable seating for 10. Outside you will find a pretty furnished patio with a BBQ for use, leading to the gorgeous garden and the hot tub which comfortably sits 7-8 guests. 2 dogs are very welcome here at Strathmore. For children we can provide 2 travel cots and 2 highchairs and a stairgate is available to fit at the bottom of the stairs. The private, gated driveway has space for 4 cars in total. Enter into the grand hallway which leads to the dining room, snug, family bathroom and the lounge. The impressive staircase leads from here too. 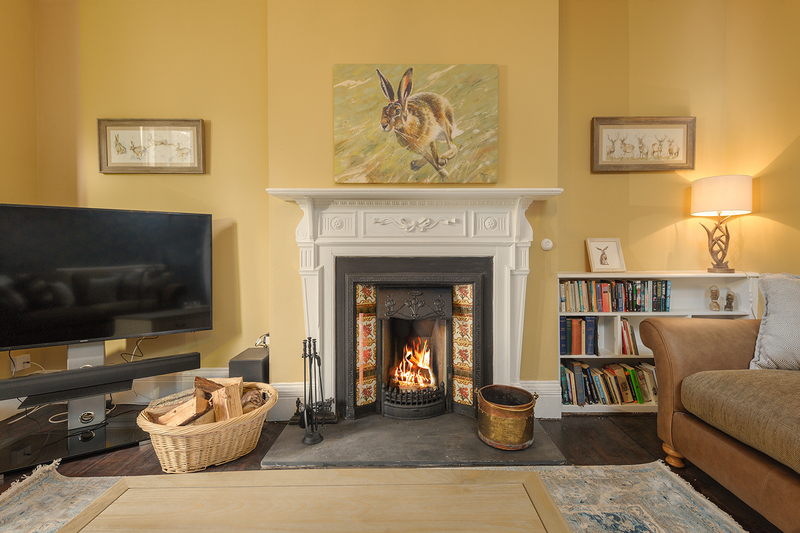 The large lounge is a cosy and grand room, focusing around the original open fire. There is a 58″ Smart TV (with full access to Netflix) sits next to the fireplace and the collection of armchairs and sofas seat 10 guests very comfortably. There is a huge bay window looking out to the front of the house and plenty of board games for all the family to enjoy. A Bluetooth portable speaker is also provided. Netflix replaces the use of a DVD player and DVD’s. An initial supply of coal and firelighters are provided throughout the year, with additional supplies available to purchase when booking. The beautiful kitchen is a treat for the eyes. 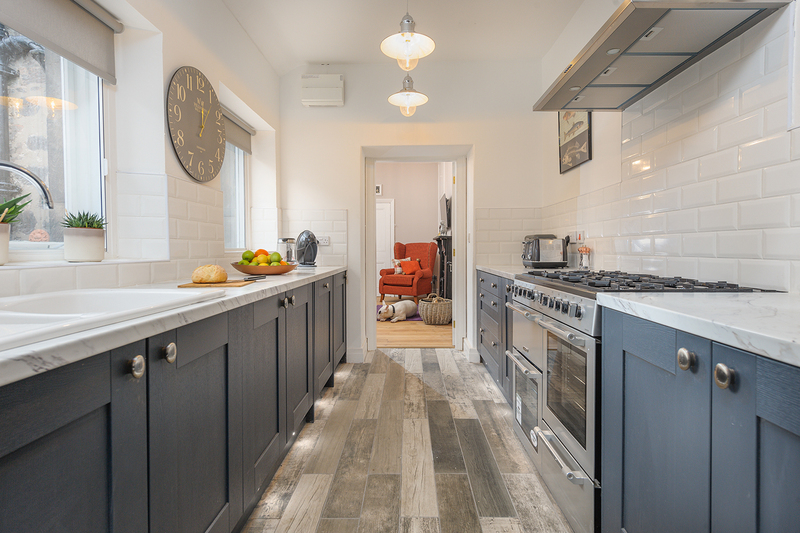 White marble surfaces and deep navy shaker-style cabinets are a perfect mix of classic and contemporary, which is a great fit for this newly refurbished traditional home. You’ll find all the usual appliances here such as an electric range oven with 5-ring gas hob, washer/dryer, dishwasher, American-style fridge/freezer, microwave, 4-slice toaster, kettle, Dolce Gusto coffee machine and cafetiere. The kitchen leads out to the patio too. 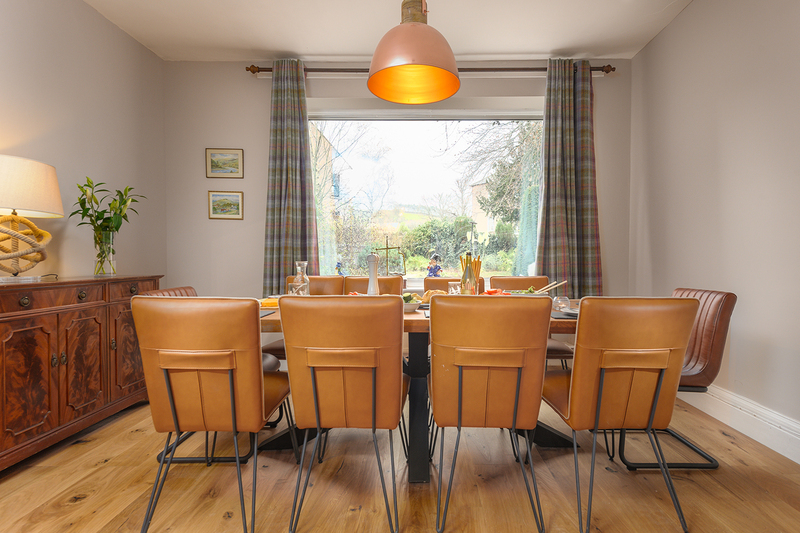 The cosy dining room has a huge table seating 10, which is perfect for indulgent breakfasts and homely Sunday lunches. The window looking out to the garden is almost the full width of the wall, letting in lots of light. The dining room leads to the snug with a wood burning stove. The cosy snug bridges the space between the dining room and the kitchen and is complete with a wood burning stove. This inviting area is perfect for a relaxed coffee in a morning or just for some time-out (or change of TV programme!) from the rest of the family in the lounge. It’s also a great place to play board games and for kids to play if adults are at the dining table. An initial supply of logs, kindling and firelighters are provided throughout the year, with additional supplies available to purchase when booking. The first of the family bathrooms is on the ground floor. 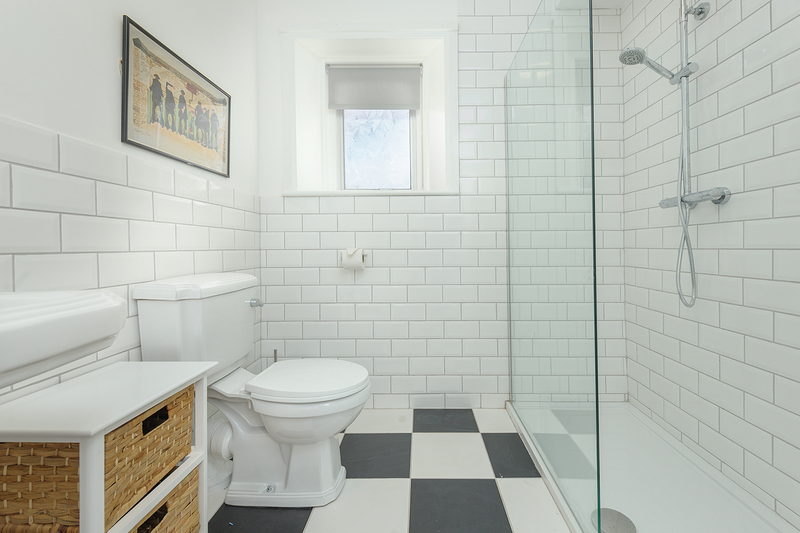 This fully-tiled traditional bathroom has a walk-in shower, WC, basin and heated towel rail. Complimentary Noble Isle toiletries are provided. The grand stair case leads to the first floor where you’ll reach 3 bedrooms and 1 bathroom. This impressive bedroom has a unique and romantic twist. The fabulous roll-top bath takes centre stage, set within the bay window in this huge room (with a shower attachment). The bed is super king size (6ft wide) and there’s plenty of storage between the wardrobe and drawers. Luxury linens and fluffy white towels as well as a hairdryer. Contained within the room is a WC and basin in a private compartment with a lockable door and frosted glass. Complimentary Noble Isle toiletries are provided. 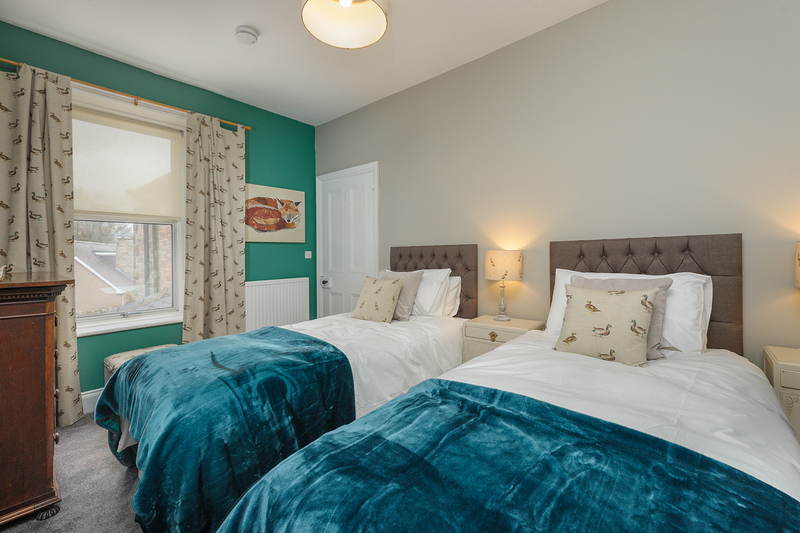 This cosy room has the option of twin single beds or a super king size bed (3ft wide/6ft wide), please select if you require a super king size bed upon booking. There is a 40″ Smart TV and plenty of storage for clothes. Luxury linens, fluffy towels and a hairdryer are all included as standard. 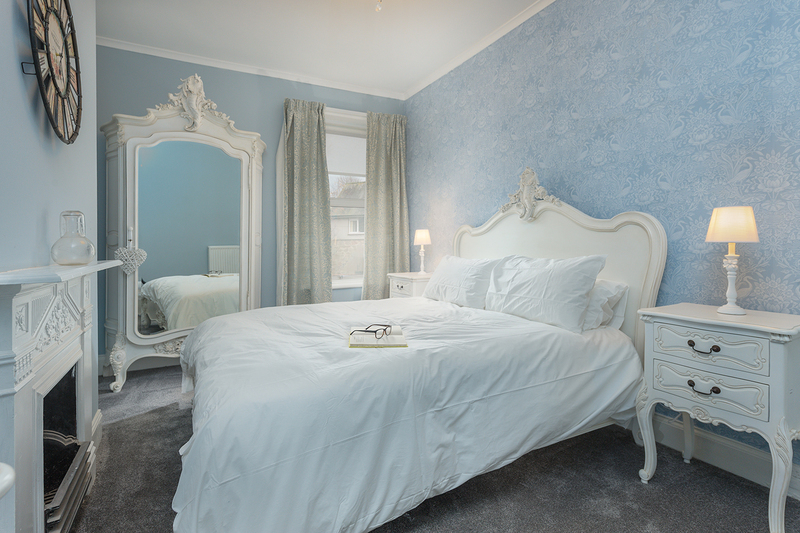 This pretty, feminine room is painted pastel blue with ornate distressed furniture. The bed is king size (5ft wide) and there’s plenty of storage including a huge armoir with a full-length mirror on the front. Luxury linens, fluffy towels and a hairdryer are all included as standard. This bathroom has the same facilities as downstairs and is fully tiled with soft grey tiles. There’s a walk-in shower, WC, basin, heated towel rail and complimentary Noble Isle toiletries are provided. Follow up the stairs to what was once the large attic of this huge family home, converted into 2 bedrooms. The head height in these 2 bedrooms and bathroom are slightly limited, so please read the descriptions below fully for the taller members of your group. The second floor would be perfect for a family of 4 looking for a little bit of privacy amongst the rest of the party. This bedroom has a king size bed (5ft wide) and huge Velux windows letting in lots of natural light during the day. 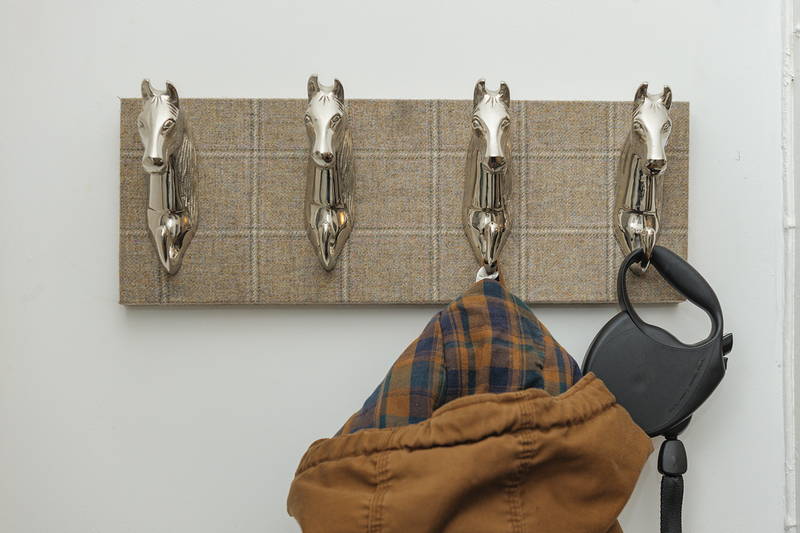 There’s plenty of storage for clothes and luxury linens, fluffy towels and a hairdryer are included as standard. 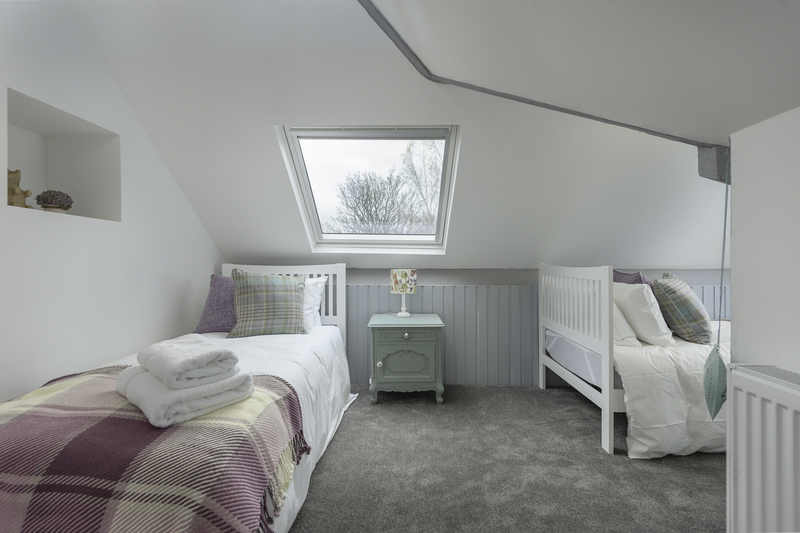 Please be aware that whilst the head-height in this room is normal, the ceilings slope down towards the corners of the room, meaning where you get into bed the head height is slightly restricted. The Velux window is above the bed, but comes with a blackout blind for lighter mornings and evenings. This bedroom has twin single beds (3ft wide), a wardrobe and a dresser for clothes storage. Luxury linens, fluffy towels and a hairdryer are provided. 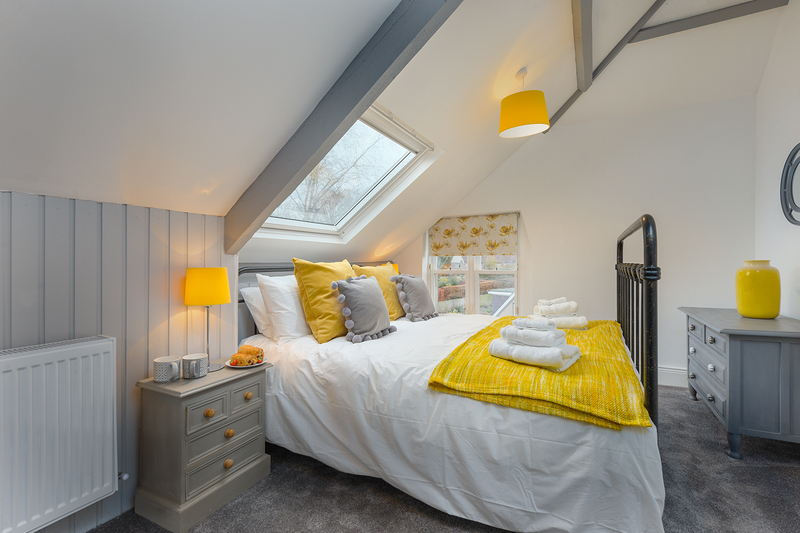 The head height in this bedroom is restricted and we would advise anyone over 5ft 8″ to choose another bedroom to stay. The central section of the bedroom can accommodate this height but the rest of the room has a sloped ceiling. This bedroom would be perfect for children, although the decor doesn’t specifically reflect that. 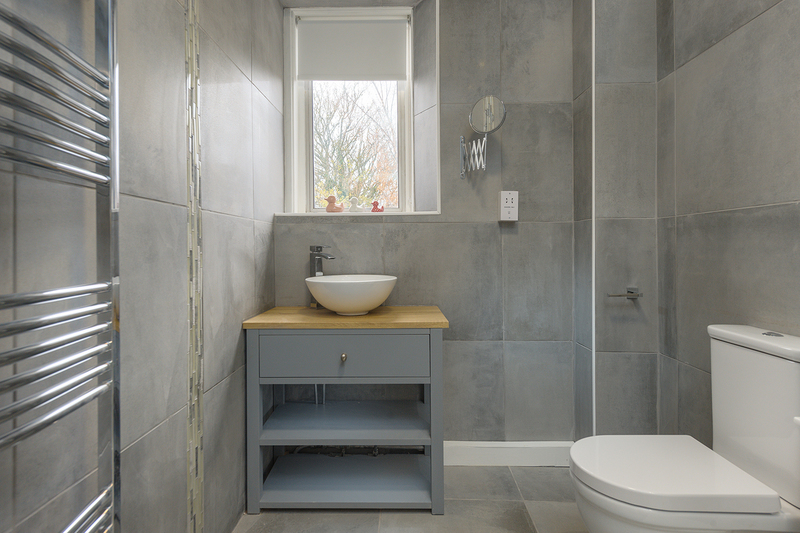 The en suite has been tastefully paneled and contains a bath with a shower attachment, WC, basin and heated towel rail. Complimentary Noble Isle toiletries are provided. 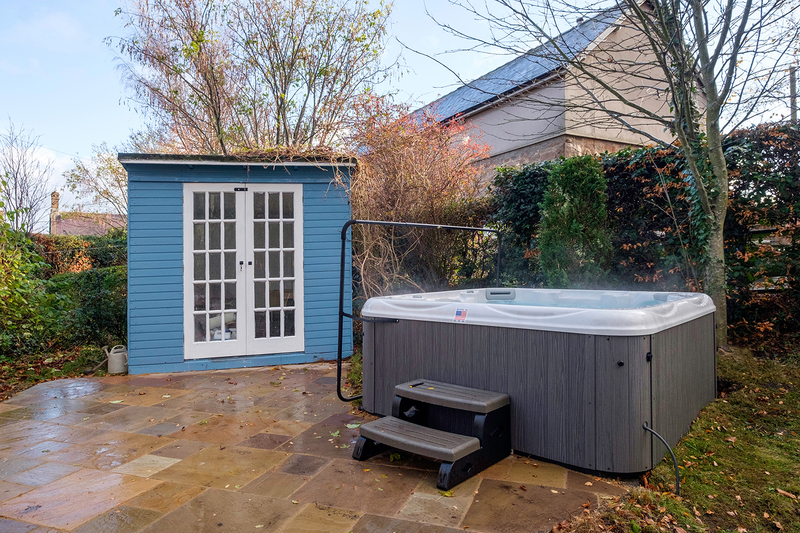 The pretty garden is private and not overlooked, containing a fabulous 7-birth hot tub next to the summerhouse. The south-west facing patio is furnished and contains a BBQ and chiminea for balmy summer evenings. The garden is enclosed but not secure, so whilst every effort has been made to secure the garden, the owners nor Coquet Cottages can take responsibility for the garden not being fully secure. Private parking for 4 cars is available on the driveway which is gated. Additional cars can be parked on the roadside outside Strathmore. Smart TV’s, 2 real fires, a hot tub, pet friendly, enclosed garden… need we go on? Strathmore is ‘The House that has it all’ and for a party of 10 guests, you couldn’t be more comfortable here. Up to 10 guests and 2 babies welcome. Luxury welcome hamper including branded complimentary toiletries and bespoke area and property guide. Hot tub, wood burning stove and open fire. An initial supply of fire fuel will be provided throughout the year. Additional bags of fire fuel can be purchased direct from the owner or from local shops. Two babies welcome. 2 travel cots and 2 highchairs and a stair gate available at the bottom of the stairs upon request. Smart TV’s in the lounge, snug and Country Room with access to Netflix. Bluetooth music system and free unlimited Wi-Fi. The pretty garden is enclosed and lawned, with the hot tub and summer house in one corner. Outdoor games will be kept in the summer house for the busy season months. The south-west-facing patio is furnished and has a BBQ and chiminea for use. There is a charcoal BBQ provided at Strathmore with the understanding the BBQ is cleaned after use and left as it is found. One bag of charcoal will be provided for use and can be found in the summerhouse. Private parking is available for 4 cars on the driveway which is gated. Additional cars can be parked on the roadside outside Strathmore. The two bedrooms & bathroom on the second floor have restricted head height, so taller members of the group would be more comfortable sleeping in one of the first floor bedrooms. The hot tub is designed for 7 guests with 7 seats inside. 5 bedrooms across 3 floors – 1 super king; 2 king size; 1 twins or super king; and 1 fixed twin single room. All duvets and pillows are non-feather. 2 family bathrooms and 2 en suites; both family bathrooms have a walk-in shower, WC, basin and heated towel rail – they are located on the ground and first floors. The master bedroom has a roll top bath (with attachment) within the room and a separate WC and basin. 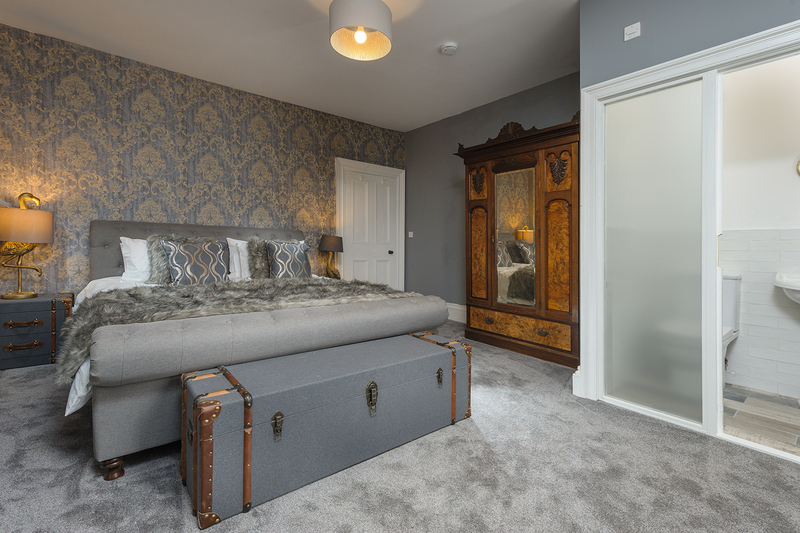 The Angus Bedroom on the second floor has a bath with attachment, WC, basin and heated towel rail. American-style fridge/freezer, electric range oven with 5 ring gas hob, dishwasher, microwave, toaster, kettle and Dolce Gusto coffee machine. Washer/dryer, iron, ironing board and vacuum. Hairdryers, books, games and access to Netflix on all 3 TV’s. Accommodation is across 3 floors and is not suitable to guests who struggle with stairs. The hot tub is a fantastic addition to Strathmore and you’re guaranteed to have lots of fun with it! The water is replaced every changeover day, so it’s fresh for each holiday. This means that the hot tub may not be hot enough until 5-6pm on the day of your arrival during the colder months. Please understand that this is so the hygiene of the hot tub is maintained. The owner of Strathmore will need to check the PH levels of the hot tub each day. She will pay a visit once a day for no longer than a couple of minutes to check the chemical levels are correct. The owner doesn’t need access to the house and this visit will not be intrusive whatsoever, it is purely for your health and safety. Plastic glasses are provided for use outside, please do not use any glasses outside. You have the option of paying either a £250 refundable Good Housekeeping Deposit or a smaller non-refundable £46 Deposit Waiver, which covers you to the value of £250. Please choose which option you prefer when booking. Click HERE for more information. Here you can explore Strathmore in 3D virtual reality, click on the arrow to start then use your mouse or touch screen to explore all areas. 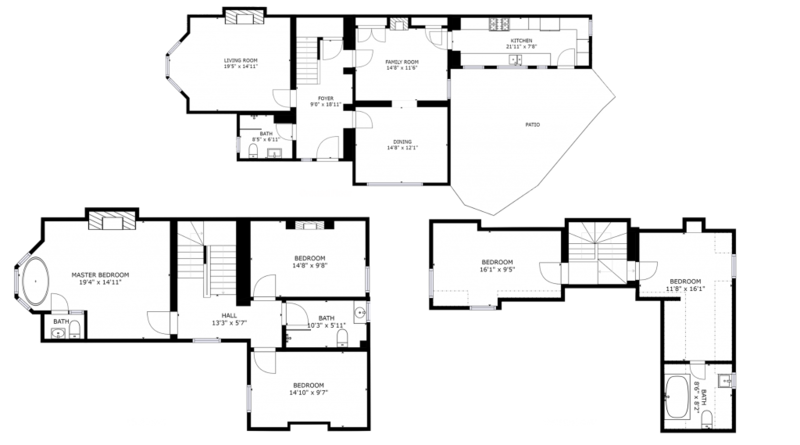 Please click on the floor plan to enlarge it – it displays all 3 floors. If you have any further queries, please don’t hesitate to contact us and we’d be delighted to help. Email us or call us on 01665 710700. Known as ‘The Gateway to the Cheviots’, Wooler is the perfect base for a picturesque country getaway. This pretty town has plenty to offer, with superb cafes, restaurants, pubs and quaint shops on the main street, just a short stroll from Strathmore. The locals are very friendly, and although it is small, Wooler has a plethora of activities and events nearby to partake in during your stay. The Farmer’s Market is held on one Sunday of every month from April through to October, with a special Christmas Market held at the beginning of December. The nearby Glendale show on August Bank Holiday Monday is always a huge success with both locals and visitors from far and wide, and Wooler even hosts its own annual ‘Glendale Music Festival’ on the 3rd weekend of July. The surrounding area has you spoiled for choice, with Harthorpe Valley (commonly known as Langleeford), Ingram Valley, and Linhope Spout offering breath-taking walks towards the impressive Cheviot Hills, starting just a couple of miles from Wooler. Just 6 miles away, nestled on the Northumbrian Moors is eerie Chillingham Castle and Grounds, and the rare Wild Cattle of Chillingham. If you’re heading to the coast, a 25 minute drive takes you to Bamburgh, Beadnell and Seahouses, or for a full day out, the border town of Berwick (25 minutes North) has 2 gorgeous beaches, providing both coastal and country river walks with yet more lovely cafes and amenities to try out. You can explore the location of Strathmore on the map below, which allows you to zoom in and pan out to gain a good idea of the area. The postcode of the property is NE71 6BP. What a treat to stay here for Christmas! The house was beautifully decorated and the welcome hamper was lovely! A cosy, welcoming, spacious house. Thanks for letting us stay! Dine at the fantastic Milan Restaurant in the heart of Wooler. This family-run Italian is hidden away in the old stables of the Black Bull Hotel. The food is sublime and the staff go above and beyond to make your experience enjoyable and memorable for the whole family. They also provide a take-away option if you’d prefer a cosy meal in the cottage! If dining in, be sure to book a table to avoid disappointment – it is very popular! Take a picnic to Langleeford! At the foot of the gorgeous Cheviot Hills, Langleeford is a walker’s paradise, with rolling hills and dipping valleys offering breath-taking 360 views. Pick a spot by the Harthope Burn, pop your blanket down and enjoy your lunch in this stunningly peaceful setting. Explore Chillingham Castle and Walled Garden, just 6 miles from Wooler. The impressively preserved 12th Century castle is full of history, and the friendly room guides make your visit extra special with tales to tell about every room if you wish them to. The castle has a pretty grizzly past, so if you’re feeling brave enough, why not try one of the night time ghost tours to experience the castle and grounds after dark! Visit nearby Fowberry Moor Sporting Ground to try clay pigeon shooting. 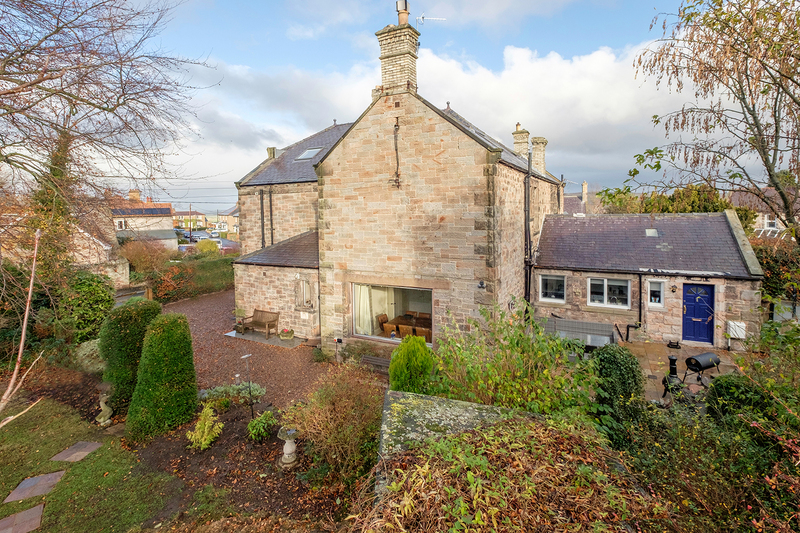 Just 4 miles East of Wooler, this is the ideal place to embrace the beautiful countryside and test your aim! Click HERE to visit the website – booking is required. “Hamish was brought up and lived in Strathmore since 1971 and would love to share his idyllic childhood memories with others. His father, from whom he inherited the house, was the last generation of vets to have lived and practised here since 1890. Strathmore is a treasure in our family’s heart. It is a wonderfully warm and sociable home, which still retains it’s Victorian elegance, although we have also brought it up to the 21st century with a beautiful, cosy interior and all the latest mod-cons. There is nothing more enjoyable than being snuggled up in front of the wood burner in the snug with a mug of hot chocolate or stargazing in the most relaxing hot tub with a glass of bubbly. Situated in the stunning National Park of the Cheviots, it is well situated to visit both the Northumbrian Coast and Scottish Borders within an easy 30 minute drive.